Seventh overall last year, Ireland’s Nicolas Roche will hope to equal or better that performance in the upcoming Vuelta a España, which begins in twelve days in Benidorm. 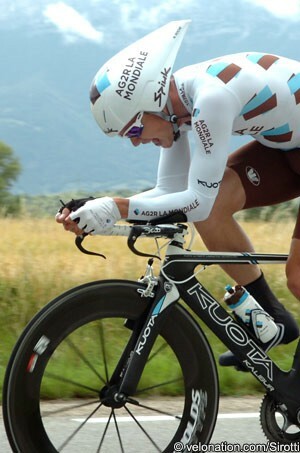 The Ag2r La Mondiale rider is psyched to perform after what has been a difficult season, wanting to turn things around in the Spanish event. The team today confirmed its lineup, naming the eight riders who will back Roche in the event. It’s almost completely a French selection, with Guillaume Bonnafond, Dimitri Champion, Cyril Dessel, Steve Houanard, David Le Lay, Lloyd Mondory and Mathieu Perget all representing that nation. Aside from the Irish captain, the only other foreign rider is the Italian Matteo Montaguti. Roche has made it clear that the Vuelta is a big target for him. Last month he went into the Tour de France targeting a top ten finish, but admitted that injury disruptions over the past half year made him uncertain how things would turn out. The most recent of those was his big crash in the Critérium du Dauphiné and, as the Tour progressed, it became increasingly clear that he wasn’t at peak form. He eventually finished the race 26th overall, and so a strong Vuelta will be a priority for him.